The American Heart Association encouraged local women to make heart health a top priority. 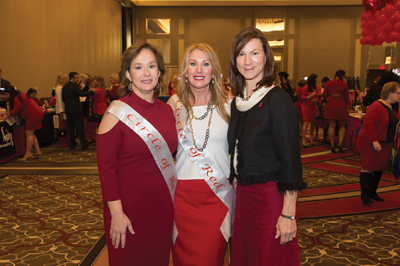 The “Go Red For Women Luncheon” was aglow with red, with participants wearing light-up tiaras, flowers, sparkles and feathers, providing a dramatic backdrop. The luncheon is part of the Go Red For Women movement, which encourages women to take charge of their heart health. Valerie Englade and Colleen Monaghan served as Co-Chairs. Guest speaker Madeline Jones, a young heart transplant survivor, shared her story with attendees from the podium. The Go Red For Women silent auction, called “Purseanalities,” featured purses assembled by local celebrities, movers and shakers. These purses, filled with the donors’ favorite things, were auctioned off at the luncheon. Treasures included restaurant gift certificates, spa treatments, museum passes, jewelry, books and more. This year featured “Purseanalities” by Kathy Womac and The Womac Law Firm, Stephanie Burks, Dr. Louis and Janie Glade and Anita Demps.